You bring up your site and … something’s not right. Your browser might be the first to alert you that your site has been compromised. If malware is detected, the red screen that says, “The Website Ahead Contains Malware!” is a sure sign that your website needs deep cleaning. The hacker might not have been successful or they may have been interrupted, leaving code fragments on your site. It will look like a bunch of gibberish to the average person and will often be displayed at the top of bottom of the site. Hackers may be using your site to send spam emails by the thousands, in which case your entire server and the sites hosted on it will slow down. It is possible that it’s another site on your shared server that was hacked. Here’s hoping, except now we feel bad for them. ISP’s maintain spam lists to blacklist domains that send out 1,000’s of spam emails. If your site is being used to send out emails by a hacker, then your domain may be blacklisted. If this happens, even the emails you personally send out will be marked as spam. If the admin section of your site and the public section of your site look the same, then the hackers may have been skinning your admin section to look like your public facing site. This type of hacking comes with not-so-clever additions promoting the hackers’ prescription drug or adult site of choice. You find words that you didn’t type in weird places or added links for products that aren’t yours. These links might even be given stealth placement inside technological or scientific words. And sometimes the links are in another language. You suddenly see a crazy traffic spike for a post you made two years ago. Or it seems like everyone in Russia has suddenly jumped on your website for no apparent reason. Maybe you see extra comments that cannot be explained. The big indicator here is a sudden spike in foreign traffic. Google watches your site for problems when it makes its scans. If it finds one, it will report back to you inside Google Webmaster Tools. Unfortunately, it will also tell your visitors as well when they try to come to your website. This is what causes those warning boxes that pop up in your browser when you visit a site. If you’re a developer or you can work on your own code, you can monitor your site yourself for strange activity. PHP files in your theme, the .htaccess file and the extra files in your WordPress home directory are all common places to find hacked code. You’re looking for hidden or obfuscated code. You can scan your entire file structure for “base64” or look at the ends of PHP files for anything you don’t recognize. Sucuri SiteCheck will scan your website against a database of known problems and determine if it’s been hacked. 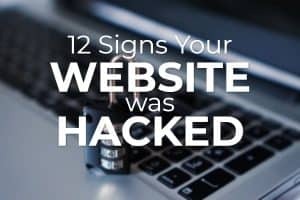 It looks for 10 different items to make sure your site is safe, including viruses, spam and redirects.